Here in Delaware, the Department of Labor was created to help build great businesses through a strong workforce. This is the department that is designed to oversee all things related to work and employment. There are “subsections” of the Department of Labor that are tasked with assisting particular types of employment needs. For example, the Division of Employment and Training will assist persons looking for work with, among other things, the Delaware Job Link. The Division of Unemployment Insurance helps those workers who become unemployed and wish to receive unemployment benefits. The Division of Vocational Rehabilitation assists disabled individuals in obtaining employment, and assists businesses in hiring disabled employees. It also administers the Federal Disability Determination Services to support the income of unemployed, disabled persons. Last but certainly not least, the division that is nearest and dearest to my heart is the Division of Industrial Affairs. The Division of Industrial Affairs strives to promote and develop the welfare of workers (employees) in the State of Delaware, by improving working conditions, and advancing opportunities for profitable employment. This is the division that is responsible for overseeing any and all work injury, or Workers’ compensation claims. The Office of Workers’ Compensation is a “subsection” of the Division of Industrial Affairs, which, as you already know is a “subsection” of the Delaware Department of Labor. There are 2 State Offices of Workers’ Compensation that handle Delaware claims. One office is in Wilmington on Market Street, and the other is in Milford on N.W. Front Street. The office hours, locations, forms, frequently asked questions, statutes and a wealth of other helpful information about Delaware Worker’s Compensation claims can be found on their website at http://dia.delawareworks.com/workers-comp/. If you have been injured in a workplace accident, I recommend that you speak with an attorney to get an idea of the benefits to which you are entitled. 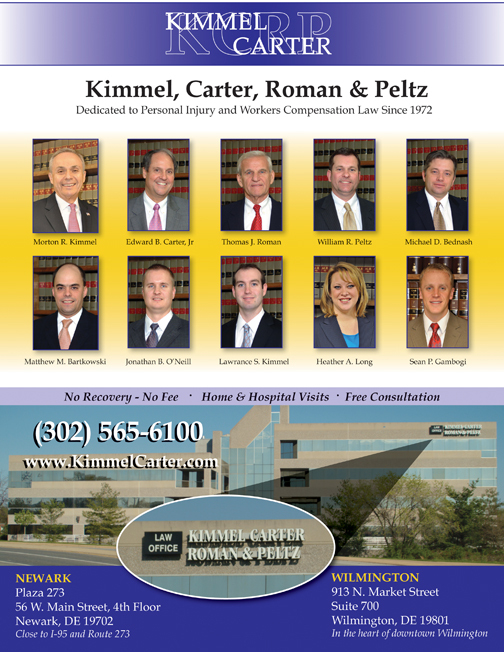 The legal team that I have the pleasure of working on at Kimmel, Carter, Roman & Peltz, has handled claims of injured workers, and has achieved successful results for over 40 years. If, however, you choose not to hire an attorney, you can find many forms on the above website to get your claim started. The first form you should receive after reporting your workplace injury to your employer is called a “First Report of Injury”. This form is supposed to be filled out by the employer and submitted to the Office of Workers’ Compensation within 10 days of your injury. It is important to note that just because this form is filled out and submitted does not mean that the employer agrees that your injury occurred in the way that you say it did, or that they agree with the type of injury that you say was sustained. This form simply details the information that you gave to your employer regarding your injury, and lists your wage at the time you were injured. The second form you should receive is an “Agreement as to Compensation” or “Agreement” for short. This form is the employer’s acknowledgement that your injury is accepted, and it notes the date of injury, nature (what kind) of injury you sustained, as well as the weekly wage and corresponding Workers’ Compensation rate of pay. This form is often accompanied by a “Receipt of Compensation Paid” (or “Receipt” for short), which is an acknowledgement by you, the injured worker, of receiving the benefits outlined in the “Agreement.” If the employer fails to give you an “Agreement” and “Receipt”, chances are that they are not accepting your claim. This could be due to any number of reasons from the employer not believing that you were injured while on duty, to the employer disputing the severity of your injury. If this is the case, you will need to file a petition with the Office of Workers’ Compensation, Industrial Accident Board. If your claim rises to this level, I can not stress enough the need for an attorney on your side. The employer is not permitted to represent themselves at the Workers’ Compensation Hearings, and you should not either. If you believe that you were involved in a workplace injury, report the injury as soon as possible and then seek medical attention. Your employer will have their own attorney working against you, so you should enlist the help of a skilled attorney to make sure that you receive all benefits to which you are entitled. All of the attorneys at Kimmel, Carter, Roman & Peltz are skilled litigators, and can ease the burden of dealing with the insurance company and your employer. The consultations are free, and the advice is invaluable! 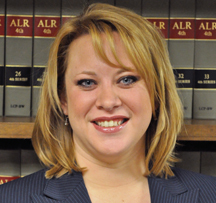 Our attorneys will fight to get you all the benefits that you deserve. ← Previous Story Announcing The Morris James Personal Injury Group New Phone App! Next Story → New Law. Adequate Automobile Insurance Coverage?